Comments on N.C. civil litigation and law to lawyers and non-lawyers. --Bradley A. Coxe J.D. After several years and over 150 posts, this blog is changing homes. It will be hosted on my firm's new website at http://www.hcpplaw.com/blog. Thanks for reading and I hope you will follow me over to the new site. If you are subscribing by email, you may have to reenter your address on the new site. Take Time to Heal after a Car Wreck. This is a tragic story, but one that is not that uncommon. My heart goes out to this family who will be dealing with this horrific car wreck for the rest of their lives. Putting on my lawyer hat for a moment, there are a lot of areas in the law this event touches on. Things like negligence, contributory negligence, damages and other topics in civil and criminal law that I have touched on in this blog. My thoughts at this time are for the family. They have likely already gotten mail from lawyers advertising their services. There is a lot of debate among lawyers as to how dignified or tasteless or worthwhile these direct mail services are, but they are for the most part automated and go out to every accident that generates a police report. My advice to this family and anybody who has been in a wreck is don’t worry about a lawsuit or hiring a lawyer until you are ready. Don’t feel pressured to retain an attorney or to hire the first one you talk with. Don’t feel pressured by the insurance company to make a statement or give them records. Tell them you will get back to them when you are are ready and have hired a lawyer.Take care of your family and take care of your injuries, physical and mental. The law gives a person with a physical injury three years to begin a lawsuit (the statute of limitations). Some people want to wait for time to heal. Some people want to get it over with as soon as possible. Either way is ok. It just has to be the best way for you. -Bradley A. Coxe is a practicing attorney in Wilmington, NC who practices in Personal Injury, Car Accidents, Medical Malpractice, Contract and Real Estate disputes, and all forms of Civil Litigation. Please contact him at (910) 772-1678. Landlords have a streamlined process in North Carolina to evict tenants who have breached their lease. This is called summary ejectment. After the tenant has breached the lease by failing to pay rent or otherwise, and after the tenant has failed to fix the problem pursuant to a grace period or period to cure, if any, in the lease, the landlord will provide a “notice to vacate,” either in writing or orally demanding that the tenant vacate the property. If the tenant leaves, it does not mean the landlord gives up any right he has to get back rent. Depending on the type of lease and the reason for eviction, the time of notice will vary. For the breach of a residential lease for failure to pay rent, 10 days’ notice is required. After the notice period has ended, the landlord may go to court and file for a Summary Ejectment, usually on a form from the clerk of court. The complaint states why the landlord wants the tenant to move out and when and where the court hearing will be held. The complaint must be served on the tenant. This is usually done by the sheriff or by certified mail, return receipt requested. Delivery may be in person or by tacking the papers on the tenant's door. If delivery is by tacking the papers on the door, and if the tenant does not go to the hearing, the landlord cannot get a judgment against the tenant for rent owed. Unless there are other reasons from eviction than non-payment of rent, the tenant can stop the process by a “tender of rent” or paying the owed rent at or before the hearing. In the summary eviction process, as well as any other small claims court action, either party has a right to appeal. The landlord or tenant has 10 days after the magistrate judge’s decision to file an appeal or the judgment becomes permanent. For low income tenants, the filing fee for the appeal may be waived; however, there still may be a fee for the sheriff to deliver the notice of appeal to the landlord. The appeal will be heard in district court, which is harder to navigate by parties without an attorney than the small claims court. Even if an appeal is filed, the tenant is under an obligation to pay rent as it becomes due, however, it should be paid to the clerk of court rather than directly to the landlord. If the tenant appeals, about two months later, he will get a notice of the date of the district court (appeal) hearing. That hearing is similar to the small claims court hearing in that the judge will hear the facts of the case from both sides and make a decision. The district court judge can ignore nearly anything the magistrate court decided. After the district court hearing, the losing party has the opportunity to file another appeal with the North Carolina Court of Appeals. This step is seldom taken since the Court of Appeals will not consider the facts, only if the district court judge made an error of law. If the tenant does not file for an appeal, or the tenant appeals but fails to pay the rent as it becomes due to the clerk of court, then the tenant has 10 days after the magistrate judge’s ruling to move out. If the tenant has lost an appeal, he has 30 days to move out. If the tenant has not moved out before the applicable deadline, the landlord can get a writ of possession directing the sheriff to remove the tenant and padlock the property. The sheriff will give the tenant notice of the date and time when he intends to remove you from the property, usually 2-3 days after obtaining the writ. After the eviction and the padlocking, the tenant has 10 days to contact the landlord and arrange to move any personal items that remain. The landlord only has to give the tenant one chance to get his or her belongings. If the belongings are still there after the 10 day period, the landlord may dispose of them as he wishes. Read What You Sign. Except Doctors. One of the first bits of free advice you’ll get from an attorney, is to read and understand before you sign a document. Even where the clause is buried on page 8 of fine print; or where there was a change from an earlier draft; or where the person was told something different; or where the person was subject to high-pressure sales tactics; or even where the person couldn’t read or write; under North Carolina law you are found to have read and understood the entire document. However, in a recent case, the North Carolina Court of Appeals found that did not apply to a doctor. The case involved a surgery patient who had developed complications. As a result, his doctor gave him a prescription for Total Parenteral Nutrition, but the prescription was missing a vital nutrient, which caused the patient to develop a permanent disability. The prescriptions are required to be signed by a doctor under federal law; however, the doctor in this case signed at least 49 prescriptions prepared by a dietician without ever having read any of them. The doctor’s expert witnesses testified that the standard of care did not require the doctor to actually read the prescriptions he was signing. The jury agreed and the doctor was found not negligent. The Court of Appeals let the decision by the jury stand although indicated they were “disturbed by the assertion that as a matter of practice and standard of care, doctors need not read what they are required by law to sign. The general advice to read before signing is still the rule for 99.9% of the population and circumstances, although the next time you are given a prescription, you might want to bring up the question to your doctor. Attached is a Board Effectiveness Checklist from governance.pro that helps an organization determine if it is being as effective as it can be. The checklist applies to all types of organizations, so all the factors may not apply to every organization, but it is a good starting point. There are some additional specific items I would recommend for homeowner associations and smaller non-profits. Have a packet of the declarations, bylaws, rules and regulations of the HOA available for every director. Since all these documents have to be consulted to make sure a board can do what it wants, it saves time and allows the board to debate real possibilities. When a board turns over as HOA boards frequently do, the new directors are able to see what exactly earlier boards had decided. I’ve been in HOA meetings where time was wasted debating and crafting new rules, when there already was an old rule that applied. It may also be helpful to have a copy of Chapter 47C or 47F and 55A of the North Carolina General Statues since those statutes govern much of what a board is allowed to do. Have a welcome packet for new residents with the same documents and other information about the community. Keep a close eye on assessment delinquencies. Usually the individual amounts are small next to the HOA’s entire budget, but they will sneak up a board. You’ll never have 100% on time payment from any planned community of any real size, but you are doing a good job if you can keep those delinquencies below 5%. Fund and maintain a reserve. Your delinquencies will go way up if you hit all the homeowners with a special assessment for roof repair or road repair. It is far easier to budget each year for a small amount to build up reserves and prevent sticker shock. Get multiple bids from outside vendors and award contracts fairly. Have all the board members understand the reasoning for any rule or decision made by the board (even if they don’t agree with it). Neighbors will stop and ask board members questions and if they can’t articulate the reasons for a decision, the neighbors will imagine unfavorable and nefarious reasons for the decision. Follow these guidelines and you will have a great community and happy neighbors. After every trial, I try to talk with the individual jurors who heard my case. It helps me as a trial lawyer determine what strategy and tactics worked and what didn’t. I will also ask them what information they wanted but never got and what questions they had that never got answered. Sometimes they even tell me about the assumptions they made on issues even if no evidence was presented in trial. They almost always want to know what the attorneys and the judge were whispering about at the bench where they couldn’t hear. It seems somewhat counterintuitive, especially in the age of instant, on-line information, but literally over two hundred years of statutes, rules and judge’s decisions have tried to limit the information presented to a jury for their decision in a trial. The main question is what the law has decided is relevant to a case. The North Carolina rules of evidence say that anything is relevant if it makes any fact of consequence more probable or less probable than without that fact. Simple right? Sometimes it is and a non-lawyer can easily see that. For example, where a car wreck happened on a sunny day without a cloud in the sky, it is probably not relevant that the defendant car’s windshield wiper blades were old. However, from the simple idea of relevance comes a host of fact-specific things that are relevant or not relevant for a trial that might not be apparent to a non-lawyer. For example, a non-lawyer might think that the fact that in our car wreck that the defendant driver had one or two prior car wrecks makes it more probable that the car wreck at issue in the trial was the defendant’s fault. Honestly, that non-lawyer might even be right (I certainly think prior acts of my kids are relevant when I am trying to figure out how the cookie jar got broken). However, the law has decided that in most cases, if a person did something before, it doesn’t mean they did it this time. Another example is insurance. If a juror knows that a particular injured party has insurance, they might be more likely to not make the at fault party pay as much. On the other hand, they might award more damages since they know an insurance company is paying for it and not out of the pocket of a sympathetic defendant. A lot of the conversations and arguments between attorneys and the judge and a lot of the objections at trial go to this underlying issue of relevance. Trials are very fact specific, so at almost every trial there is a small wrinkle in the law where the attorneys can argue whether a fact is relevant or not or if a fact can come in or not. It is important to only decide a case as a juror based on the evidence you hear. The judge and lawyers are not just making up what is important and what is not. They are relying on literally over two hundred years of fine-tuning the law and the jury system. If the judge makes a mistake, or some relevant information was left out for no sound reason, the case can be appealed and the Court of Appeals and Supreme Court can decide it was the wrong thing to do. That opinion will be written down and the next trial with a similar issue will have more guidance on the correct course of action. 1. A man who owned land that was claimed by another person. This person was coming on property and had even started tearing down some old barns on the property. The man showed me letters he had sent to the other person, and the deeds and maps that showed his ownership in the land. He had not received any information showing that that other person owned the land. Since the letter had been ignored, I told him that he would have to file a lawsuit for trespass to keep the other person from coming on the property and an action to clear title. He was allowed to file such a suit himself, but I recommended he hire a lawyer to do it. 2. A lady whose grandson was being moved to a different high school because his parents had moved. He had some disciplinary problems and the ROTC program at his current school was helping. I gave her the information to contact the local school board and suggested that she enlist his therapist to help in her hardship claim. 3. A man whose estranged brother owned farm equipment on his property. He was concerned because people were stealing and vandalizing the farm equipment. I told him that just because it was on his property, he did not have responsibility to take care of his brother’s equipment and to write him a letter and tell him so. 4. Another man whose foot was badly burned when using a riding lawnmower. The man was wearing flip-flops but said that the manual did not give any warning about footware and his friend who also used the mower had the sole of his sneaker melt. We talked about negligence and contributory negligence and I recommended he consult with a personal injury attorney. 5. A man whose friend in Texas had some child custody issues. I told him he first had to determine if any action had already been started in Texas. If it had, he would need to get an attorney there, even though the child was now in North Carolina. If there had not been an action, he would be able to file an action in North Carolina and would not have to move here to do so. I recommended he consult with a family law attorney. 6. A lady who was concerned about hunters on a neighboring property. Legally, in that area of the county, there were no laws preventing hunting in that area, even though it was close to a neighborhood where many children lived. I referred her to her county commissioners to see what could be done. I spent about 30 minutes with each individual and felt that I was able to answer everybody’s questions. Another ask a lawyer event is coming up on March 2, 2015 throughout North Carolina. If you have a question for a lawyer, please feel free to call. I love alternative history stories. Things like “What if the Soviet Union had won the Cold War ?” or “What if JFK had not been assassinated?” I find fascinating and oftentimes help me better understand actual history. I even like alternative takes on imaginary history like “What If Spider-Man had been bitten by a radioactive ant?” or “What if Superman crash landed in Siberia instead of Kansas?” I think a lot of people think about “What if” everyday. “What if I called that potential customer back right away?” or “What if I hadn’t agreed to go on a blind date?” When people are faced with a traumatic event, their “What if” imagination goes into overdrive. “What if that nurse hadn’t noticed Mom was allergic to penicillin?” or “What if I had eaten that piece of glass in my food?” or “What if I hadn’t slammed on brakes when that guy ran the red light?” Those types of events seem so wrong and so full of danger, that they think there has to be a way to sue them. Sometimes, those near-miss events are crimes and the person at fault can be fined or imprisoned. However, that doesn’t allow you to sue those people or obtain any money or any other relief for having that near-miss. The basic rule of damages for lawsuits is you can only get your “actual damages.” These damages can be “hard” damages, like medical bills, or lost wages; or “soft” damages like physical pain. But both types of damages actually happened to the injured person. You can’t get damages for “What if.” You can’t get damages for what might have happened, only what actually did happen. No matter how bad the possible outcome was you can’t recover. “I could have died!” is still only in the realm of “What if” and therefore not recoverable. With the near universal use of email, texting, Twitter, and instant messaging, small corporations and homeowner associations frequently try to use these services for the business of the company. While this practice can be valuable and efficient to manage a company or planned community, it normally cannot be used to exercise the powers and authority of a board of directors. The way a board of directors makes decisions on the direction of a company or planned community, is by voting and taking action at a meeting of the board. Any “decision” reached by an email or text chain is essentially an action by a board without a meeting. The only way any such decision is reached without a meeting is for all the directors entitled to vote to consent in writing to conducting the business by such an email chain or otherwise without a meeting. Even if a majority of directors want to conduct a meeting this way and a majority want to pass whatever motion is under consideration, it is not valid. Practically therefore, it is usually far easier to call a special meeting and make a decision by vote of the directors who attend (assuming they have enough for a quorum), than to round up written consents from 100% of all the directors. Some meetings can be held by telephone conference call or video conference. North Carolina law allows the board of directors to permit directors to participate in a board meeting electronically and not physically present, as long as all directors participating can simultaneously hear each other during the meeting. While the law is silent on membership meetings (as opposed to board of directors meetings) Roberts Rules of Order allows electronic attendance for membership meetings if it is included in the bylaws, again with the simultaneous requirement. Records of deceased persons in certain circumstances. If you are the personal representative of an estate -- either designated by a will or appointed by a court to settle a deceased person's affairs -- HIPAA gives you access to the deceased's medical records. In addition, if you are related to a deceased person and certain information in that person's medical file relates to your own health, HIPAA lets you access that information. HIPAA gives patients the right to get copies of all of their medical records except for psychotherapy notes, information the provider is gathering and compiling for lawsuits, and medical information that the provider believes could reasonably endanger your life, your physical safety, or the safety of another person. If the provider denies your request for medical records, it should provide you with a denial letter giving the reason. In such cases, you may be able to appeal the denial. In addition, the North Carolina Medical Board provides that a physician has a duty to release a copy of the patient’s medical record to the patient or a representative of the patient even for purposes of personal injury or medical malpractice investigations and lawsuits. When it comes to identifying which medical records you want, you can be general or specific. Sometimes, patients want their entire medical file. But if you’ve seen the doctor over a long period of time and don't want to pay for copies of every immunization and preventative visit for the last 20 years, it might make sense to specify which part of the record you want. Some hospital will provide a “digest” which includes the most important parts of a record including operative notes, admission and discharge reports, lab reports and radiology reports. Even if you request a full record, you usually will not get copies of actual X-rays or CT scans. You have to request those specifically. You can also narrow your request by specifying records that cover treatment over a certain time period. Billing information is usually kept separate and is not considered part of the medical record, so if you want your bills, you need to specifically request that. Once you get your medical records, you may notice they include reports from third-party providers, like specialists or radiologists. The documents from the third-party provider are what your doctor received, but they may not constitute all the medical records that the third-party provider's office has on you. If you need more information from the third-party provider, make a separate medical record request to that provider. Homeowner Associations exist to manage planned communities. Part of that duty is to enforce the restrictive covenants of the community. One Florida Homeowner received a notice of a violation from his HOA for his time machine. 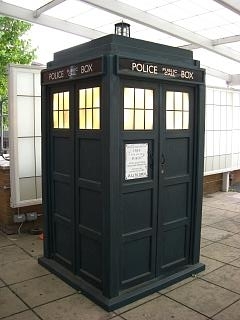 Specifically a life-sized replica of The TARDIS from Doctor Who which had been used in the couple’s themed wedding was placed in the driveway of their home. While I have never seen a restrictive covenant that prohibits the placement of space and/or time vehicles on lots, frequently there are restrictions regarding “structures” built on a lot. Sometimes those are specific such as no mobile homes or have specific parameters, such as no fences beyond the front corner of the house. Other times they are more general and even vague requiring the structure “fit into the general appearance and scheme of the community.” Often, there is an architectural committee who has the job of approving or rejecting proposed structures. Even when a HOA board refuses to act on a violation, any other owner of a lot in the community has the ability to bring a lawsuit based on the restrictive covenants for any structure in violation. The homeowner/putative Time Lord seems to have a good sense of humor about the issue and it seems that the violation can easily be solved by moving the TARDIS to the back yard. Still, if they choose to fight, I envision a Miracle on 34th St. type defense to prove the Doctor is real and not subject to the limitations on structures as their blue box is not a structure, but a vehicle. Frequently homeowner association and other nonprofit board of directors announce they are going into “executive session” and close the meeting to only the board. The North Carolina Planned Community Act provides that meetings of the organization are governed by Robert’s Rules of Order, unless the bylaws provide for a different manual of policy and procedure. According to Roberts, a closed or executive session is usually a meeting of the corporation that is closed to the public (as opposed to a member homeowner). Most board meetings of an HOA are already an executive session, and those meetings are closed to the public. The Planned Community Act requires that an executive board meeting provide opportunities for members of the association to attend the board meetings, subject to reasonable restrictions on the number of members who speak on the issue and time restrictions. What follows is that the board can restrict other portions of the board meeting and close those portions not only to the public, but also to members. This is typically what a board is doing when it announces it is going into “executive session.” Usually the only time a board will close a meeting to the member homeowners would when sensitive discussions are being held such as unpaid assessments or other debts to protect the HOA from claims under the Fair Debt Collection Act. Also discussions regarding employee performance are typically done in these closed sessions to protect against any possible EEOC complaint. Even though such a portion of a meeting may be closed, members are entitled to be provided upon request any minutes of such a closed session at a reasonable time and location. Any action (as opposed to discussion) taken by the board, even actions taken on unpaid assessments and employee decisions, should be reflected in the minutes. The member will be under the duty not to disclose those records to the public. A judge can place reasonable restrictions on the production of any corporate records and the minutes. I recently had a homeowner’s association question regarding the conveyance of common elements. Basically, the HOA owned property between a small river and about six member lots. The HOA and the rest of the property owners did not have any access to the property except by the river. The land is mostly marsh and wetlands and therefore is not buildable. There were a few existing dilapidated docks on the property that had been used in the past by the six property owners and sporadically by other property owners accessing from the river or accessing through one of the six lots by permission or without permission when the lots were vacant. Rather than continue to pay taxes on the marshland and pay to maintain the marshland when they were seldom used by the entire community, the HOA wanted to sell the property to the six owners. While an HOA in North Carolina has fairly broad powers by statute, which include entering into contracts with third parties and the use and management of common areas, when an HOA wants to sell, give away, or otherwise convey a piece of the common areas, they are much more limited. Under the Planned Community Act, at least 80% of the members of the HOA need to approve the conveyance in writing. Because this provision of the Planned Community Act does not apply retroactively, a planned community created prior to January 1, 1999 may have an even harder time conveying the property. Unless the declarations say otherwise, in these older planned communities, the transfer cannot be made unless 100% of all the members agree in writing. My association was one of these older ones, with no provision in their declarations. Therefore unless they can get in writing from all members that they can convey the marshland, they will not be able to get rid of it and will continue to have the duty to maintain the property. Only seldom do I have a personal injury case where there was not a doctor or chiropractic visit sometime in the months or years prior to the event sparking the lawsuit. An injured plaintiff can only recover for damages that were actually caused by the defendant’s negligence. If the defendant can prove that a plaintiff’s injuries pre-existed his negligence, it lowers the amount of damages that he has to pay if the jury finds him at fault. In extreme cases, the jury can find the defendant was negligent, but caused nominal damages such as $1. The best argument by a plaintiff is that the new injury is not connected in any way with a prior injury or condition. Even if the injury is in the same location or the same condition, the law allows a plaintiff to recover for the aggravation or the exacerbation of the pre-existing injury. So if you had a small hernia, one that did not require surgery, just monitoring by a doctor, but after the defendant hit you with his car, the hernia gets larger and requires surgery, the jury can award an amount of damages based on how much it got worse. I recently had this issue in a trial, and the typical, pattern jury instructions from North Carolina did not seem to address this issue. I did my research and drafted some additions to the appropriate pattern instructions. A copy of those is set forth below. The plaintiff not only has the burden of proving negligence, but also that such negligence was a proximate cause of the [injury] [damage]. Proximate cause is a cause which in a natural and continuous sequence produces a person's [injury] [damage], and is a cause which a reasonable and prudent person could have foreseen would probably produce such [injury] [damage] or some similar injurious result. An injured person is entitled to recover all damages proximately caused by the defendant's negligence. When his injuries are aggravated or activated by a pre-existing physical or mental condition, defendant is liable to the extent that his wrongful act proximately and naturally aggravated or activated plaintiff's condition. Potts v. Howser, 274 N.C. 49, 54, 161 S.E.2d 737, 742 (1968). There may be more than one proximate cause of [an injury] [damage]. Therefore, the plaintiff need not prove that the defendant's negligence was the sole proximate cause of the [injury] [damage]. The plaintiff must prove, by the greater weight of the evidence, only that the defendant's negligence was a proximate cause. In deciding whether the [injury to the plaintiff] [death of the decedent] was a reasonably foreseeable consequence of the defendant's negligence, you must determine whether such negligent conduct, under the same or similar circumstances, could reasonably have been expected to [injure] [cause the death of] a person of ordinary [physical] [mental] condition. If so, the harmful consequences resulting from the defendant's negligence such as the aggravation of a pre-existing condition (Smith v. Buckhram, 372 S.E.2d 90, 94 (1988; Potts v. Howser, 274 N.C. 49, 54, 161 S.E.2d 737, 742 (1968) would be reasonably foreseeable and, therefore, would be a proximate cause of the [plaintiff's injury] [decedent's death]. If not, the harmful consequences resulting from the defendant's negligence would not be reasonably foreseeable and, therefore, would not be a proximate cause of the [plaintiff's injury] [decedent's death]. I frequently see on social media where someone has been called for jury duty. The post is frequently followed by half-joking advice on how to get of it by telling the lawyers you believe in the death penalty for littering or will vote the way the space aliens tell you. Far from my usual practice of snarky comments, I will post a simple message stating “thank you for your service.” Since I am a proud member of Generation X and we practically invented irony, I wonder if some people think I am being sincere. I am. There are large number of campaigns to remind people of their right and duty to vote in elections, and not any that focus on the right and duty of a jury. In a national, state or even local election, your vote is one of millions, thousands or hundreds. On a jury, it is one vote out of 12. Since most juries require a unanimous result, unlike an election, your service is of even more importance. In effect, you can, with your single vote, render an effective veto over any verdict. In addition, a juror has a pretty good idea of what the effect is of their decision, whether to award an amount of money or the conviction of a serious crime, the jury will have personally heard the arguments and pleas of all the people involved. Thankfully, almost all jurors I have interviewed have taken the issues seriously, listened with healthy skepticism all of the evidence, and struggle with a fair and just result. In fact, I have more problems with potential jurors who try to say what they think I want in jury selection so they can get on the jury, than jurors who make up excuses to get off. In North Carolina, the first investigation of any motor vehicle crash is by the police. In order to assist their investigation, they use a special form published by the North Carolina Division of Motor Vehicles—“Crash Report Form DMV-349.” The form, also known as the crash report, accident report, or police report, is an essential piece of information for either party attempting to prove who was at fault. According to North Carolina law, this report should be completed within 24 hours of the crash and submitted to the DMV. You can fill out a Request for Motor Vehicle Information with the DMV for a copy of the crash report. copy of the crash report. Some police forces have the information available online, such as the Wilmington North Carolina Police Department. While the main information is easily understood regarding the narrative description of the crash; drivers, passengers, and witnesses contact and insurance information; and traffic violations that were cited; there are a number of other details. In order to decipher the codes on the report, use this key (Download DMV349). You can also use the DMV-349 Instruction Manual to help you interpret the crash report. An experienced personal injury attorney also should have a great deal of experience in interpreting the report. I believe that at some time in the past, lawyers must have charged on a per word basis. It is the only explanation I have as to why attorneys use lengthy, old-fashioned and sometimes confusing jargon when talking and writing. If you can’t understand your lawyer, chances are a jury won’t either. Just because he sounds impressive, doesn’t mean he actually knows what he is talking about. Get him to explain in plain English what he is talking about and explain again if you didn’t understand. What is even worse when a person who is not an attorney, even a very intelligent one, will try and sprinkle in words they have heard because they sound “legal.” Not only is it not needed, but if you don’t understand the words you are using, you may be saying something other than what you intend. The following list may help you decipher what an attorney might say and for attorneys to use more understandable language to get across information and assist their clients. I will occasionally get questions from friends, acquaintances, at a dial a lawyer day, or online at www.avvo.com, who want to know what they should settle for in a small to medium car wreck or personal injury. These casual, cocktail party questions are difficult. Sometimes these folks have already retained an attorney and are looking for a second opinion and sometimes they just want me to give them a number that they are entitled to. My problem is, it is often impossible to even give an educated estimate without knowing details of the case. Non-lawyers, who hopefully will only have one or two of these claims in their life, don’t understand the details that can greatly change the value of a case. Sometimes I don’t think they understand that it’s not that I’m unwilling to give an opinion, I honestly can’t give one based on the broad outline of a case. If they have an attorney, I know there is no way I have more knowledge to make an informed decision than they do. That is the reason I, as well and numerous other attorneys, offer free initial consultations. From those, I can ask the right questions to get the details I need to at least give an initial impression of the strengths and weaknesses of the case. I’ve represented blue-collar, white-collar, tradespersons and professionals, and as smart or educated as they are, they don’t know what details are important for a case. It’s the job of the lawyer to get that information. Also remember that even where the fault of the other party is clear, the amount is an estimate of what a jury would do. Every lawyer has been surprised by jury verdicts, and no lawyer should tell you any amount is certain. Every trial is a risk, and every trial costs money and time to reach a resolution. My advice therefore is talk to an attorney and get the best information you can on the risks and benefits of going to trial or settling the case for a certain amount. If you don’t get a good vibe from that attorney, find one you feel you can trust. I had a call today from a residential tenant with problem—She found a copperhead snake in her back yard. Now this being North Carolina, which happens to have the distinction as having the highest rate of venomous snake bites in the country, I didn’t see much of an issue. She told me the wildlife removal expert she had called told her the same thing, until he realized that he had removed 17 poisonous snakes from her neighbor’s house a few years before. The Residential Rental Agreement Act in North Carolina provides for rights and duties of landlords and tenants. The landlord is required to repair or remedy “any imminently dangerous condition” on the premises and the tenant is allowed to recover from the landlord any payments for such repairs that he had to make. The yard of a rental home is included in the leased premises. The statute lists a number of items that constitute an “imminently dangerous condition.” While a rat infestation and mosquito infestation are included, a snake infestation is not. My advice to her? Get the wildlife specialist to get rid of the snakes and do what is possible to prevent them from coming back. Then ask the landlord to pay for the treatment. If he refuses, she may have to file a lawsuit. However, unless the health department tells her to move out and condemns the property, she can’t move out or refuse to pay rent without breaching the lease. What happens after the settlement? When you settle a claim, before or after a lawsuit, you sign various documents finalizing the settlement. The first is a settlement agreement. A settlement agreement is essentially a contract between the parties with the dispute, setting forth the terms of their agreed upon settlement. These documents can be simple, as in “I’ll pay you this amount of money and you’ll dismiss your lawsuit.” The agreements can grow in complexity with multiple parties, time limits for payments, confidentiality clauses, payment plans, and other terms that are unique to those particular claims. Be sure you understand the settlement agreement before you sign, because you are bound by its terms, even if the other parties do not comply. For example, assume you were in a car wreck and are bringing a claim against the other driver for your injuries. You estimate your damages at $50,000. The other driver may argue that you were at fault, that your injuries were not that severe, and that you should receive $0. Both parties compromise and the defendant agrees to pay you $25,000 in a signed settlement agreement. If, after you sign that agreement, your doctor tells you that you need additional surgery that costs another $10,000, you can’t get that money from the defendant. If the defendant fails to pay the $25,000, you still don’t have a claim for a car wreck for $50,000, but rather a breach of contract for $25,000, the settlement amount. It is very difficult to get out of your duties under a settlement agreement. Like a contract, if you sign it, you are representing that you have read the document and understand it. Only in rare cases of forgery, fraud or mutual mistake will the court set aside a settlement agreement. Either included in a settlement agreement or as a separate document, is a full and final release. This document will release any and all claims you have or may have against the defendant coming out of the lawsuit or event. These releases will go further than simply prohibiting you from bringing the same claim again. They will stop you from bringing any claims against that defendant even if you don’t know about them. I have seen these releases written so it prohibits any claim against the defendant for any issue, arising at any time, based on any facts and circumstances. You or your attorney should carefully consider what other claims you have or might have in determining the desirability of settlement and should limit the release to a particular car wreck or other incident. After the settlement agreement and full and final release have signed, and the checks have been issued, deposited in your attorney’s trust account and cleared the bank, your attorney will disburse the settlement money to you, to himself for any outstanding fees and costs, and to any other entity receiving funds such as a medical lienholder. If the settlement has occurred after a lawsuit has been filed, your attorney will then take the final step and file a dismissal with prejudice with the court. Since a settlement agreement or release is seldom filed with the court, this document ends the lawsuit and again prohibits the complaint from being refiled and begun again—the “with prejudice” part of the document. Take the time to understand any settlement documents you are signing, even if your attorney says it’s ok. Once you sign, only a time machine will let you undo the deal. I’ve written before about amending the Declarations for a homeowner association. A new case handed down this month by the North Carolina Court of Appeals could make it harder for an HOA to amend the Declarations to their liking. The Linville subdivision in north Raleigh began construction in 2003. As an incentive to builders to construct homes in the planned community, the Declarations allowed a builder to pay only 25% of the annual assessments. When the housing boom ended, several builders were unable to sell the properties they have built but continued to pay reduced assessments pursuant to the Declarations. In 2011, The Linville Owners Association, Inc., passed an amendment to the Declarations following the amendment procedures in their documents and the statutes, ending the special status of the builders and requiring them to pay the same amount of assessments as all other homeowners. The builders refused to pay, and the North Carolina Court of Appeals eventually heard the issue. The Court of Appeals found that the original assessments were included in the Declarations to induce and encourage builders to build in the community. To change that, even by following the amendment procedures in the Declarations, went against the original intent and purposes of the Declarations. The Court therefore found the amendments unreasonable, invalid and unenforceable. I’ve only seen this rule applied before where an HOA didn’t have assessment power in the original declarations and then added that power in an amendment. This Court of Appeals ruling makes even an amendment of the amounts of assessments set in the Declarations to be called into question. When considering an amendment, HOAs should determine what their reasons are for the amendment, why it conforms and assists in the original purposes of the declarations, and why it does not unreasonably divert from those purposes. One of the more frustrating things a homeowner association board deals with is unpaid assessments. I’ve written before about how the fees and costs of collecting a valid assessment can greatly exceed the amount of the assessment. Occasionally, a board will try and put social pressure on delinquent owners to pay by publishing lists of the owners who have failed to pay and the amounts they owe. I don’t know how effective these “shame lists” are, but they are not allowed under North Carolina law. First, HOAs are subject to North Carolina’s Debt Collection Act for the collection of unpaid assessments. This Act prohibits certain acts undertaken to collect a debt. One of the prohibitions is against publishing such a list of homeowners who have failed to pay their assessment. Second, the publishing of such a list would open the HOA up to a defamation lawsuit if the list was not true and accurate. A listed owner would therefore have a strong case against the HOA for publishing a list and could receive not only his actual damages, but his attorney fees as well. Note that if a member of the HOA was to ask for financial information pursuant to his right to review financial records and minutes of the HOA, that information may be disclosed to that member. Occasionally I will get a phone call from a person looking to see if they have a lawsuit for something in their food. I've had people complain about bugs, wood, glass, bone, plastic and other more gruesome things. One locally famous case found a finger. Apart from a certain entertainment value that appeals to my inner junior high student, these types of cases, gross as they are, usually have very little legal value. One reason is that some things are foreseeable in food. A lot of times a bit of bone in a hamburger, or shell from some shrimp, is something that you might find naturally in food. The law only finds a server at fault when the size, quality, quantity or the food has been particualrly process that a person can't foresee that such an item may be in the food. Of course, a foreign non-edible object, such as a piece of plastic, also is not foreseeable. The second reason comes from the basic law of damages. The law of damages is designed to put somebody where they would have been had there been no negligence. The law, under the implied warranty of merchantability, will allow you to recover medical bills, and physical pain and mental suffering from a broken tooth after biting down on a rock, but just a gross experience is not recoverable. Only in very extreme circumstances can anyone recover for just emotional distress, and as disgusting as some of the stories I have heard, nothing has risen to that level. The law in North Carolina tends to support the ability of people to work for who they want, and when they want. In most cases, with at-will employment, an employee can leave a job whenever they want to work for another company who may provide them more pay or benefits. On the other hand, the law recognizes that businesses have legitimate interests that could limit the rights of former employees. One way a business can narrowly protect its interest is through the non-compete contract as I’ve written about before. Another way the law protects a corporation’s business is provide a fiduciary duty that its owners and members owe to the corporation. Still another way when a non-compete clause and fiduciary duty don’t protect a business is the trade secrets statute. Chapter 66, Article 24 of the North Carolina statutes is the Trade Secrets Protection Act. This law allows a business to sue in civil courts for the misappropriation of a trade secret for actual monetary damages and a court order returning or stopping the use of the trade secrets. Depending on how egregious the conduct, punitive (punishment) damages and attorney fees are also available. To “misappropriate” a trade secret simply means to take it or communicate it without being authorized to do so. If the trade secret was arrived at by independent development or reverse engineering, there is no misappropriation. Proving that something is a trade secret is a little bit trickier. Under the statute, a trade secret is any business or technical information that derives independent value from not being generally known or easily created. The statute includes as possible types of trade secrets formulas, patterns, programs, devices, compilations of information, methods, techniques, and processes. To illustrate, a list of customer names and addresses is not a trade secret since such a list can usually be readily created. However, a customer list that includes specific pricing could very well constitute a trade secret. In addition to providing value from its being not generally known, a “trade secret” must be the subject of some protection from the company to maintain it as a secret. It is logical that if you do not care enough about certain information, that you take no steps to keep it secret, it probably isn’t a trade secret. It’s a good idea to include in any employment contract some specific definitions of what you consider your business’s trade secrets, to make any possible litigation down the road be as streamlined and as inexpensive as possible. --Bradley A. Coxe is a practicing attorney in Wilmington, NC with Hodges & Coxe PC who specializes in Personal Injury, Medical Malpractice, Homeowner's Associations, Contract and Real Estate disputes and all forms of Civil Litigation. Please contact him at (910) 772-1678. A few days ago, I spoke at a local middle school for a careers class. Thanks to some links from the North Carolina Bar Association, I was able to download and print out for the students a mini-mock trial for them to do in class. I had 4 witnesses, 3 lawyers for the plaintiff and 3 lawyers for the defendant. The “case” involved an alleged bullying incident. The Plaintiff alleged that the Defendant had always bullied her and on this occasion, pushed her down, causing her injury and a broken Ipod. The Defendant claimed she never pushed her and saw the Plaintiff, who had a history of “clumsy” behavior, run into an open locker. For the most part, the students were reviewing their statements and formulating their questions and arguments on the fly, but there was at least one line of pretty good questioning that I missed on my review of the facts. It was interesting how they made some of the same mistakes that even experienced attorneys fall into. One thing several did was jump right to the facts, without even asking the witness their name. I’ve never done that, but sometimes you do tend to forget that the jury is hearing all the evidence for the first time. An attorney has to be diligent in making sure the jury is educated on each part of the case. Another thing was the plaintiff was talking to her lawyers. I had to remind her that they were not trying to convince her attorney, or me, or the other attorney, but the rest of the class, the jury. Sometimes even in the middle of trial, I have to remind my client it doesn’t matter what they think is fair, it’s what the jury thinks is fair. Finally, while they were fairly focused when they were asking or answering questions, they would drift off or whisper to each other when it wasn’t their “turn.” I had to remind them, as I remind my clients and keep in mind myself, that even when they are not active, the jury and judge is still watching them. They really paid attention when I told them that a judge could put them in jail for contempt of court for talking out of turn in his courtroom. Several decided then and there to be judges. The kids had fun and hopefully learned a little bit about what it means to be a trial lawyer. In North Carolina, the Declarations (also called restrictive covenants) are the main governing document of a homeowner’s association. While the general statutes of the state remain the ultimate authority, they give a large amount of leeway to a planned community to craft its own governing documents. Usually the Declarations are pulled from a boilerplate set and filed by the developer at the beginning of a project. As such, in a mature HOA, the Declarations may be inconsistent or have parts that are simply undesirable for the members. In that case, the declarations can be amended and changed. Under Chapter 47C for Condominiums and 47F for other planned communities, an amendment to the Declarations may be amended only by a yes vote of 67% of the votes of the members. The declarations can also require a greater percentage for an amendment, but the percentage can’t be lower than 67%. Here’s how to make changes to CC&Rs. 1. Talk to your neighbors first. Obtaining a 67% majority of all the votes of the association is hard, so strong membership support is essential. Usually apathy rather than active opposition is the problem with amending the declarations. 2. Avoid controversial amendments such as those changing assessments so that some members pay more or less assessments or those requiring unpopular use restrictions. 3. Send out the exact text of the amendment. If there are relatively few changes, help the members by sending two versions — a “redlined” one showing what is being removed and added, and another version showing the exact text. If your association is pursuing a complete rewrite of your Declarations, a “redlined” version will be too complicated. Instead, consider sending along a summary or highlights of what will be new or different. 4. While trying to amend Declarations, consider if bylaw amendments are also needed. Bylaws generally deal with elections and removal of board members and officers. The process for amending the bylaws should be contained in the bylaws themselves. While the statutes regarding planned communities do not require a minimum percentage, the statutes regarding non-profit corporations, which is how most HOAs are set up, do. Under Ch. 55A, the bylaws can be amended by 2/3s of the total votes of an association or a majority of the votes actually cast at a meeting. 5. If homeowners want to express their disagreement, let them. The board should already have expressed why the amendment should be passed, in HOA meetings or newsletters. If there is a lot of disagreement or misunderstanding, the board should slow down and work more to build a consensus. 6. Have an attorney prepare the amendment. Declarations and bylaws are legal documents. Sometimes, amendments can unknowingly violate the law or contradict another part of the Declarations. Have your attorney involved very early in the amendment process to avoid wasted effort. Explain to your lawyer what you want and let him draft the language to make that happen. 7. Make sure your amendment is recorded. Once it is filed with your county’s register of deeds, all owners and future owners are deemed by law to have notification of the amendment and are therefore bound by it. Our kids spend thousands of hours in the public schools of North Carolina. Not only are they on school grounds for classroom work, they participate in a vast amount of after school activities such as cheerleading, baseball, football and other sports. Just like a store or a private residence, negligence can occur from the actions or inactions of staff, teachers, coaches, or administration at a public school. The claims against a school or its employees would be the same against any other landowner or any other person. Depending on the facts, this could be a claim that the teacher or coach negligently acted or failed to act and caused an injury. It could also mean that there was a hidden or concealed condition that the school knew about and the injured person did not, and the school failed to correct or warn and caused injury. The school would have the same defenses that a private person or landowner would have, primarily any contributory negligence on the part of the injured person, which would bar his recovery. This defense is mitigated somewhat as a child 7 and under cannot be found to be contributorily negligent and a child between 7 and 14 will be compared to a reasonable 7-14 year old, rather than a reasonable adult. The main defense a public school will have that a private individual or landowner will not have, is the defense of sovereign immunity. The general rule in North Carolina is that you cannot sue the State or its lesser government entities such as towns and school boards. Therefore, under the general rule, even if you have negligence, you cannot sue a public school or school board for your injuries. However, there are some exceptions. First, the activity must be a traditional government activity. Any classroom activity is a traditional government activity and would be protected by sovereign immunity. The courts have also found school basketball games and after-school daycare are also protected under sovereign immunity. Only where the activity is not a traditional activity is sovereign immunity not a defense, as when a city runs a concert arena or rents out low-income housing. The second exception occurs when North Carolina allows itself or its lesser governmental entities to be sued. Suits against the state or its agencies can proceed before the Industrial Commission rather than the state courts. School bus accidents can also proceed in this manner. Also, the state has provided by statute that if a governmental entity entitled to sovereign immunity purchases liability insurance, it has waived any sovereign immunity right up to the amount of that insurance. Historically, this has been the route to defeat sovereign immunity arguments against schools. However, in recent years several counties in North Carolina, including my home county New Hanover, have not purchased insurance but rather participate in the North Carolina School Board Trust. While it appears that the trust would have the same function as true liability insurance, the North Carolina Supreme Court has determined that a school board that participates in the Trust does not waive sovereign immunity. Even where sovereign immunity exists, some counties will allow for a small amount of recovery for medical bills of the injured student that are not paid by the student’s health insurance. In New Hanover County, this amount is $2500. Finally, even where the school and school board is protected by sovereign immunity, that protection does not extend to the individual teachers, coaches or staff that were negligent. While an individual teacher likely would not have personal assets to pay for a serious injury to a student, the teacher may have a personal policy of insurance they have privately purchased or obtained through membership with a teacher union or organization. Also, beginning in 2012, the state has paid for an “excess educator’s professional liability policy” for personal liability for teachers in their professional capacity (probably to remove the impetus for the teachers to join a union). Although the policy says “excess,” if the school board has paid nothing voluntarily, that excess insurance should be primary and pay from the first dollar spent, or at least after the school board has paid the $2500. Has this ever happened to you? You are getting ready to race go-karts, rent a truck, scuba dive, or lease a storage unit and the owner hands you a document to sign. Maybe you read over it, maybe you just skim the front page for what you are getting and how much you are paying. If you pay a little more attention, maybe you notice it says you are responsible for any property damage or personal injury and you “hold harmless” the owner. Most likely, you have not truly considered what the possible consequences are of your signature. Parts of a contract or agreement that take any responsibility from the owner to you are known in the law as indemnity clauses. If you wreck the owner’s go-kart, then you’ll have to pay for it. If you ram your go-kart and hurt somebody else on the track, you and not the owner of the go-karts will pay for it. Most people would agree with that and think it fair, but frequently those clauses try to go far beyond that. For example, I have represented a client who was renting an item from its owner. The owner did not perform inspections on the item as he was supposed to and the item was defective. Not knowing it was defective, my client was severely injured (paralyzed) when it collapsed on him. My client had signed a contract and within that contract was an indemnity clause. However, not only did my client agree that he would be responsible for damage to property or to his own injuries, he did so even if it was the fault of the owner. Most people would not agree with that if they thought about it. The owner can cause injury to you even if he was at fault, even if he did it intentionally, and you, who had zero fault would have to pay for your own injuries. This far reaching indemnity clause (also called an exculpatory clause) is allowed in North Carolina, but the courts, recognizing that this is an unnatural result, limit these provisions as best they can. In order to be effective, the contract language must be clear and explicit that they are protecting the owner from his own negligent or intentional acts. The courts “strictly construe” the language. Nevertheless, if it is in the contract, the court must uphold it. There are a few exceptions. An indemnity clause protecting against a party’s own negligence is prohibited by statute for construction contracts. Also, if the activity is extensively regulated to protect the general public from danger, this type of indemnity clause is prohibited. The courts have found this exception in contracts for health care, motorcycle safety training, and cosmetology. Finally, an exception has been found when the parties have unequal bargaining power. This exception usually only applies where the person was not given the opportunity to read the clause. Note that under North Carolina law, if you sign something, legally you are representing that you did read and understand what you signed. 1. Statistics show that doctors do not leave states without medical malpractice caps. The Florida court points out that the statistics show the opposite. 2. Medical malpractice lawsuits are a fraction of the cases of actual medical malpractice, even ones causing death. Reduce medical malpractice and any "problem" with medical malpractice lawsuits will fix themselves. 3. Medical malpractice lawsuits are resolved by a jury. That jury can and does include people who can award or limit damages based on a large number of factors that are specific to that particular case, including people who believe plaintiffs file cases without any merit and injured patients get a windfall of money for their injuries. The jury is the most powerful democracy in the United States. One vote out of 12 on a jury will have much more impact on a person that one vote out of millions in a general election. Arbitrarily limiting the maximum amount a jury can award makes as much sense as mandating a minimum amount they must award. I have just completed a two and half day trial where I represented one of the owners of a small business. After working together for over ten years, the two parties split up, both professionally and personally. Although the two parties could agree that the business was over and should be dissolved, they had very different ideas as to what each should receive. My client asserted that she was a 50% owner in the business; that the business consisted of several boats and trucks; that the business generated a significant amount of profit both before and after she was forced out. The other party claimed that he was the 100% owner of the business; the boats and trucks were his own personal assets; and the business in its best years made a minimal amount of profit. Regardless of the outcome, a large amount of attorneys fees could have been saved on both sides had the parties done some additional work in setting up and running their business. First, they did not put it in writing how much each of them owned in the business. This is required by North Carolina statutes, but the state is not going to double-check behind each business to make sure they have a written operating agreement. The document that is filed with the state for incorporation of a limited liability company will only note the names of the member/managers and incorporators. Neither of whom have to be owners. Second, it was undisputed that the title of the boats and trucks were in the name of the individual, and not the business. However, under the North Carolina statutes, title in boats and trucks does not as a matter of law mean you are the owner. We put on evidence that the trucks and boats were purchased by the business, used for the business and sold for the business. Again, something in writing listing the large assets of the corporation would have resolved any lawsuit before it began. If they were personal assets, a written agreement loaning or renting them to the company would also have protected the individual and provided certainty to all the owners of the company. Third, the two owners did not record in one place all the income coming in and all the expenses going out. The invoices were prepared and payment checks were recorded in accounting software, but payments made in cash were not. Expenses were also not recorded but made from checks from the business account or from cash. Non-business expenses were also made out of the business accounts complicating things even farther. All this made it difficult, if not impossible to actually value the company and determine what, if anything it was earning. Better record keeping would have gone a long way to determining what a fair amount each party should receive from the business. After you are involved in a car accident, but before you retain an attorney, you are in a critical and dangerous time. You begin dealing with insurance company representatives in an effort to get compensation for your personal injury or damage to your car or other property. Even the most fair and honest claims representative does not have the mandate to get you the most he can for your injuries, or even to get you a fair amount. His job is to provide you with the least amount he can that will quickly resolve any claims you have. In doing so, there are a number of things adjusters do, either on purpose, or just by the nature of the situation, that push you to quickly resolve your claim, and in doing so, you run the risk of settling for far less that you would otherwise be entitled to. While the guy you buy the insurance from works out of a small office with one or two employees, and is always available on the phone, or Saturday on the golf course, or Sunday in church, he is not the person who is making the decisions on what your will receive from your car accident. That person is usually in a different city, and will handle sometimes up to 150 separate claims in a variety of geographic locations at any one time. In contrast, you have only one case that you are concerned about. Discussing the claim in a timely matter may therefore mean different things to the adjuster than to you, even assuming the adjuster is not purposefully ignoring your claim. You may become impatient for a resolution and quickly agree to a settlement, dreading protracted negotiation. Resist that urge. If you are having constant communication problems, consider making all your requests by letter. Insurance companies can face unfair and deceptive trade practices lawsuits on claims handling even on cases they have the right to deny if they fail to reasonably make an investigation and timely notify you of their denial or acceptance of your claim. Keep in mind that in a motor vehicle claim you have three years under the North Carolina statute of limitations to file your complaint. In most cases, just because you are trying to get cooperation from the insurance company, or even when you are actually communicating, the statute of limitations does not stop running. If the adjuster wants to take a recorded interview of you, consult with an attorney. While it may seem to you that their insured is at fault in the accident, an innocent statement by you, admitting to any contribution to the wreck, will immediately provide the adjuster with a large bargaining chip to lower the value of your claim. North Carolina has contributory negligence, meaning that if a jury were to find you to have even a small amount of fault, you would not recover anything, even if the other party was much more negligent. Typically, when they determine that their insured is at fault, the insurance company will provide offers to settle the property damage claim (damage to the car and contents) and the personal injury claim. Usually the property damage claim is easier to settle. They simply go by the Kelly Blue Book value for the car. As a result, oftentimes this claim gets settled before any personal injury. When you accept money for the property damage, be sure it follows the typical practice of only settling the property damage and not the personal injury. The personal injury, even when fault is not an issue, will typically take longer. Agreeing to a value on pain and suffering, the amount of injury that is caused from the motor vehicle collision as opposed to a pre-existing injury, questions of what is “reasonable” medical care, and ongoing treatment, make settlement of the personal injury claim harder. Unlike a worker’s compensation claim, the insurance company will have no interest (and there is no law to force them) in paying your ongoing medical bills as you go. They will write one check and you will release them permanently. Once that is done, there is no going back, even if additional, unforeseen medical bills arise later out of the same car wreck. So again, don’t sign away your personal injury claim just to get a quick resolution (the goal of the insurance adjuster). Be immediately suspicious if the claims examiner tells you that you don’t need an attorney, and if you do, you’ll just reduce the amount of money you receive. While this may be true in some cases, don’t take the word of the claims examiner. Most personal injury attorneys will offer a free consultation where they can let you know the risks and benefits of proceeding with an attorney. A good attorney will tell you when not to hire them. With a property damage only case, or a personal injury case that simply involved an E/R visit and maybe some X-rays just to confirm there are no broken bones, it usually would make economic sense to proceed on your own. Any additional amount an attorney could get would be eaten up by the fee. If it involves ongoing treatment, it usually makes sense to hire a personal injury attorney. Again, in either case, take a free consultation first. I recently competed a semi-famous one-act play entitled "Box and Cox." The play is a 19th century farce about two men. Cox works all day as a hatter, and Box works all night as a printer. An enterprising landlord, Mr. Bouncer, decides to rent them the same room without telling them. This works remarkable well, until Cox gets a rare day off and finds Box in “his” room. How would this play out under modern North Carolina landlord/tenant law? In North Carolina, in every residential lease, there is a promise that the tenant will have undisturbed use and enjoyment of real property. Known as a covenant for quiet enjoyment, this promise is implied in a lease, even if it is not expressly written into the lease. Mrs. Bouncer would have breached this covenant of quiet enjoyment as to both Box and Cox. Both parties would have a cause of action against Bouncer. Assume that Box signed his lease before Cox. Box would therefore have the legal right to the room. He could also recover any monetary damages against Bouncer he may have suffered, including increased utility fees, personal items (coal, sugar, candles and Lucifer matches, according to the script) that were consumed unknowingly by Cox. He could also sue for a return of some of his rent. A “rent abatement” action allows the wronged tenant the difference between the rent actually paid, and the market value of what was actually received. If Bouncer had leased to two tenants who knew they would be sharing, how much less would those hypothetical renters have paid? The one thing that Box could not do (unless Bouncer agreed to it) would be to break the lease and move out. Only where the landlord actually physically removes or blocks access to the premises (eviction) or where the circumstances make it impossible to remain on the premises (constructive eviction) could he legally break the lease. Cox would have a claim for monetary damages against Bouncer, but couldn’t get the actual room (what the law calls “specific performance”). In addition to a recover for the same types of monetary damages that Box would enjoy, Cox’s monetary damages could also include the difference between the cost of a comparable room and Bouncer’s room, moving and relocation expenses. I’ve written before about the lien procedure required when a homeowner’s association is attempting to collect on past due assessments. Some of the HOAs I’ve worked with have annual assessments as low as $50, but still have a handful of people who neglect or refuse to pay. My staff is trained on the process of organizing and filing liens, allowing me to supervise the work and figure out what to do if something comes up that is not typical of most of the liens we file. This keeps legal fees down, but my bill can still be considerably more than the overdue assessment. I frequently tell all my clients to consider their cases from an economic and business perspective, even if they have a personal injury or emotional claim. I will tell them I don’t want to charge them more for legal work than they may receive in a settlement or verdict. Why then, do I advise my HOA clients to file liens even when my fees, as low as they are, may still be more that the amount they are trying to recover? First, the legal fees are low enough that a worst case scenario, no recovery, will not cause any hardship on any medium to large sized organization. The legal fees get even lower where I have several liens to file at the same time. Second, in my experience, a large number of the unpaid assessments come from simple neglect. Even where a homeowner has received multiple letters from the HOA board and ignored them, there is something about a legal document, on file with at the courthouse, which will shake the procrastinating homeowner out of their stupor. In my experience, over half the time my office gets a phone call asking how much to pay and where to send the check. Third, if the HOA declines to enforce their assessments, more and more people will ignore them. That causes a situation where a group of homeowners are essentially making voluntary payments to fund an entire planned community. A question arises if the board is fulfilling the duties that are required under the statute. Fourth, once a lien is in place, it will remain for three years. During that time, any sale or refinancing of the home will be held up until the lien is satisfied. Therefore, in many cases, the liens are paid automatically in a closing. Finally, unlike most legal actions, reasonable attorney’s fees are recoverable for the filing and enforcement of a lien. While, there will no doubt be judgments for assessments and attorney fees that are simply not collectable, it is well worth it for a homeowners association to at least file the liens on unpaid assessments. If the lien is not satisfied after the three years, action must be taken by the HOA to enforce the lien. As that would require far more legal fees than the filing of the lien, another analysis must be made by the attorney and the board before taking that step. Most Non-profit corporations, including homeowner associations, have a volunteer, part-time executive board, with a full-time professional manager, management company, or executive director. The relationship between these two parties can get tumultuous. After a large turnover in board membership, the new board members may see the professional manager as a holdover and supporter of the old regime. Conversely, a long time manager may become so invested in an organization, they dismiss new board members as temporary and amateur dabblers in the business of the organization. For a smooth running non-profit organization, it is important that the professional manager and the volunteer board understand their respective duties and responsibilities. The board of directors of a non-profit corporation has a duty to discharge its duties in good faith, with the care of a reasonably prudent person, and in a manner he reasonably believes is in the best interest of the corporation. A board for a non-profit organization owes its duties to the corporation’s mission goals. A board for a homeowner’s association owes duties to the planned community and the owners. The purpose and goals of the corporation are usually contained in its bylaws or articles of incorporation. A board of a non-profit is not expected to operate the non-profit’s day-to-day operations. Those tasks are delegated to the executive director, staff, and/or management companies. The board is responsible for overseeing those persons and their activities. The following major duties are suggested for a non-profit board. 1. Provide continuity for the organization by setting up a corporation or legal existence; to represent and advocate to the public and its members the organization's goals and point of view through its products and services. Specify a job description for that chief executive which could include his executive relations with the board, leadership in the organization, in product/service/program planning and implementation, and in management of the organization and its personnel. Review and evaluate the chief executive’s performance regularly on the basis of that specific job description. Offer administrative guidance and determine whether to retain or dismiss the executive. 3. Govern the organization by broad policies and objectives, formulated with the assistance and agreement of the chief executive and employees, including assigning priorities and ensure the organization's capacity to carry out products/services/programs by continually reviewing its work. 4. Acquire sufficient resources for the organization's operations and to finance the products/services/programs adequately. Providing for fiscal accountability, approving the budget, and formulating policies related to contracts from public or private resources. Accepting responsibility for all conditions and policies attached to new, innovative, or experimental products/services/programs. The president of the board of a non-profit has the same duties of good faith and reasonableness as a board member. The statutes do not set forth specific duties of the chairman or officers but allow the corporation to set the duties of the chairman and other officers in its bylaws. Typically the president has the duties of a chairperson as set forth in a standard manual of parliamentary procedure (such as Robert’s Rules of Order) and presides over the annual, executive, and special meetings of the organization. The president and other officers will represent the organization to the public. In many cases, the president has additional administrative functions, which are set forth in the corporation’s bylaws. In the rare cases where there is no professional executive director or management company, the president may take on a larger number of management functions. Even where the bylaws of the organization do not refer to an executive director or other staff position, the board generally has the power to hire and contract with employees and independent contractors and to define their duties. The board of directors and officers are also allowed to reasonably rely on the expertise and competency of those individuals. Robert’s Rules of Order describes an executive director as a salaried individual who devotes full time to the position of administrative officer and general manager of the organization, usually under a contract of employment. He is responsible for seeing the board’s instructions are carried out; recommend plans of work; conduct the day-to-day business of the organization; and hires, fines and determines salary of other staff members. Robert’s notes that in many organizations, the professional executive director provides all the management functions that would otherwise be exercised by the president, leaving the president with the duties to preside over meetings and act as a spokesperson for the organization. The executive director takes orders and direction from the board, and not from the president or another officer independently. As typically the professional executive director is operating under a contract, specific tasks and duties that he is to perform are contained in that contract. Generally those tasks and duties are in line with the executive director providing day to day management of the organization and carrying out the goals and policies as set by the board. In general, the standard business practice of a non-profit corporation, including homeowner associations, provides for an executive board that formulates policy and direction and oversees the professional executive director or manager as he conducts the day-to-day affairs of the corporation and carries out the policies established by the board. Under Chapter 47C for condominiums and 47F for other planned communities, a homeowner’s association is required to purchase certain types of insurance. In both types of communities, the HOA is required to provide insurance for damage to the common elements of the association. A common element is anything owned by the association, and not an individual owner, and not an individual lot or condominium unit. Typical common elements include parking lots, pools, clubhouses, and green spaces. For condominiums, common elements also include shared walls or structural elements between townhomes. The amount of insurance must be at least 80% of the replacement value of the insured property. It must be insured for all “direct physical loss commonly insured against including fire and extended coverage.” “Extended coverage” is not defined in the statutes. The standard definition in the insurance industry for “extended coverage” generally covers physical damage due to wind, hail, fire, smoke, riot, civil commotion, aircraft, and vehicle damage. Currently, these coverages are typically included in the standard insurance policy rather than as an extended coverage endorsement. Note that this does not include flood insurance, and therefore, depending on the restrictions in the declarations, the HOA may not be required to purchase flood insurance. For condominiums where the individual units are stacked, one on top of the other, the insurance includes not only the common elements, but the units themselves. This does not include any improvements or betterments that were installed by the homeowner. For example, if the base unit includes carpet and Formica counters, the insurance will cover the replacement cost of those materials, even if the homeowner had installed hardwood floors and granite counters. The HOA is only required to purchase this insurance if it is reasonably available. If certain coverages are unavailable or unreasonably expensive, the HOA simply has to notify the unit owners of the gap in coverage. Even though a homeowner in a stacked condominium has coverage under the HOA’s policy, I would recommend that he purchase additional coverage. Known as an HO6 policy, the condominium unit owner insurance would cover personal property, interior walls, floors and ceiling, including any improvements. Although there may be some overlap between the HOA’s policy and the owner’s policy, keep in mind that one way HOAs keep down the cost of insurance is to agree to a high deductable. The owner’s policy could cover part of that deductable. To illustrate, assume that a tenant in an upstairs condominium unit leaves the water running in the bathtub. The upstairs unit fills with water which soaks down through the walls and ceiling, and damages the lower unit’s furniture and hardwood floors. The insurance company for the HOA accepts the claim as a covered peril. After subtracting their deductable (let’s say that amount is $10,000), the insurance company pays for the damage to the upstairs floors, the areas within the common wall and between the floor and ceiling of the stacked units, and the amount to replace the damaged hardwood floors with the original carpet. They do not pay for the cost to replace the more expensive hardwood or the furniture. The below unit owner has an HO6 policy which pays for the furniture and the additional amount to replace the hardwood after subtracting their deductable (let’s say that amount is $1000). The HOA then assesses the upstairs unit owner for the $10,000 deductable amount as they caused the damage with their negligence. If the damage did not come from the negligence of the upstairs neighbor, (assume a faucet broke rather than the owner left the water running) then the HOA would likely assess both owners for the $10,000 deductable. At that point, the downstairs neighbor’s HO6 policy may pay part of that assessment that goes to damage to the ceiling, walls and floors. --Bradley A. Coxe is a practicing attorney in Wilmington, NC with Hodges & Coxe PC who specializes in Personal Injury, Medical Malpractice, Homeowner's Associations, Contract and Real Estate disputes and all forms of Civil Litigation. Please contact him at (910) 772-1678 or at bcoxe@hc-lawfirm.com. When you are called to go to court for your own case, or as a witness in somebody else’s case, hopefully your attorney or the attorney calling you has prepared you for your testimony. You should have some idea as to the questions he will ask, the answers you will give, the cross-examination topics of the other side, and how best to make your testimony clear, believable and truthful to the judge or jury who is hearing your evidence. What witnesses frequently fail to do, and attorneys neglect in their preparation, is the non-verbal communication the witnesses is giving the jury when they are not on the stand answering questions. There are a few things for a witness to keep in mind as they sit in the courtroom waiting to be called so they don’t undermine their verbal testimony. First, you should consider yourself always on. In the courtroom, in the courthouse, in the parking lot, at the downtown lunch counter, always assume there is a juror looking at you. In one case I tried, I won after what I thought was an exceptionally devastating cross-examination of the defendant. Thinking to pat myself on the back, after the trial I was interviewing jurors on my performance in trial. When I confidently asked about my withering cross-examination technique, I got a resounding “meh.” What really hurt the defendant’s testimony was the jurors seeing him laughing and carrying on in the parking lot at the end of a tough day of trial where the plaintiff had talked about her serious injuries. On another occasion, the juror turned on a defendant because he kept rolling his eyes and sighing throughout the plaintiff’s testimony. One juror gave the then timely reference to "Al Gore face." Second, spinning off of the first point, dress with respect for the court. I saw one District Court judge look incredulously at a defendant on trial for marijuana possession wearing a Bob Marley T-shirt. I’ve been told by people more fashionable than I to dress “business casual.” I used to tell my clients to dress like they were going to church until a termite inspector showed up for court with a three-piece suit, cufflinks and a tie pin. I certainly don’t need my clients to be dressed better than I do. The jury might get confused on who the actual lawyer is. Third, unless you are the party in the lawsuit, or a close relative there for moral support, don’t stick around and watch the trial. The longer you sit in the courtroom watching the proceedings, the more any appearance of being unbiased erodes away. Fourth, when you are testifying on the witness stand, look at the jury when you give answers longer than one or two words. They are the ones that need to hear your testimony and they are the ones that are going to judge your credibility. Finally, tell the truth. This is as important in a non-verbal sense as it is in a verbal sense. Don’t manufacture tears, or make other big emotional productions. The jury will know you are faking your responses and will then take a short trip to assuming your verbal testimony is a lie as well. One of the new laws for homeowner associations in North Carolina is a law “encouraging” parties with a dispute with their HOA to try and resolve the dispute before filing a lawsuit. The statute provides for a voluntary prelitigation mediation that is similar to a mediation required in every North Carolina Superior Court case. The only wrinkle I see in the new law is the statute of limitations for filing a claim is tolled until the mediation is concluded. Therefore, you are not penalized with a shortened period of time if mediation fails and you need to file a lawsuit. The law is curious in that it doesn’t really do anything (other than the statute of limitations extension I just mentioned). The mediation is voluntary and either side can refuse to do it. In addition, prior to the law, there was no prohibition from doing what the statute describes. I have participated in a prelitigation mediation for HOAs and members on a number of occasions. The law specifically excludes a member’s failure to pay an assessment or fine or fee from being covered by the statute, but again nothing would prevent a prelitigaton mediation on that basis. If either side declines mediation under this statute, and the case is filed in Superior Court, it will wind up in a mediation anyway. The law does require the HOA to notify the members every year that they can initiate mediation under this law and include it on their web site. If the HOA doesn’t have a website, it needs to publish the notice at the same time it gives the required list of the names and addresses of all the officers and board members of the association. Once I had to explain to one of my kids why they had to brush their teeth every night. I told them I knew it was a hassle and took up ten minutes that they could use to play Angry Birds, but it was important because they could get cavities and we’d have to go to the dentist for a filling. They would rather use that ten minutes than to use an afternoon getting fillings and I would rather pay $.85 for a toothbrush than a few hundred dollars for fillings. This is preventative medicine and most people get the concept at least for their health care. However, those same people ignore preventative medicine strategies in other parts of their life. Typically, in cases about contracts or business, lawyers charge by the hour. I have the same hourly rate if I am reviewing a contract, drafting a contract, or representing somebody in a dispute over a contract. However, the amount of hours I spend on litigating a contract is far more than what I would have spent in an initial review of a contract. In just about every suit on a contract or business dispute I’ve had, I can see in the document where I could have simply added a small paragraph or changed a word in the agreement that would have gone a long way to quickly resolve or even prevent the issue I was litigating. Most of these contracts and agreements were not drafted or reviewed by attorneys. Often what the person thinks the contract or agreement says is not actually in the contract, or at least is not clear. If you are signing an agreement, have an attorney review it. They will have clauses and requirements that you may not have considered. They may find that the language in the contract and what you intend are different. If you do have a jargon-filled contract, they can explain to you what it means so you know what you are agreeing to, and change it if needed. If you want to terminate a contract or business agreement take the document to an attorney before you do so. I have recently handled a case where a business owner didn’t like the way his partner was running the business and thought that he could just give up his ownership and walk away. However, there were loans from the bank that he had guaranteed. As it stands, he has to pay money for loans to a business he no longer owns or works for. If he had consulted with an attorney who could have explained the risks, he may have been able to get out of the business cleanly. It’s always easier to fix problems before they become problems. One attorney I know had a client who was a partner in a new business. The attorney kept trying to get him to get his partner to sign an operating agreement so that the amount of ownership interest for each was clear. The client kept putting it off because every thing was going well and he didn't want to rock the boat. When the time came to sell the business, the partner had conveniently forgotten any oral agreement he had on the split of the proceeds of the sale. The client eventually won, but it cost him about ten times as much in legal fees to get the same result. Always remember to use a little bit of preventative medicine in your business arrangements. Always ride on the right side of the road, and in a bike lane if one is available. Don’t ride on the sidewalk. Admittedly, the law in North Carolina is a bit murky about riding a bike on the sidewalk. The statutes state that a bicycle is a motorized vehicle and no motorized vehicle should be driven on the sidewalk, but other statutes provide that cars should yield to pedestrians or bicyclists on sidewalks. There also may be local ordinances regarding bicycles on the sidewalk. As a safety issue, expect for small children, it is usually safer to bike on the roadway rather than the sidewalk. Neither pedestrians or cars expect a bicycle on the sidewalk and at every intersection or driveway, you are in greater risk of being hit. Driving a bicycle while under the influence of alcohol or drugs is illegal. When riding at night, equip your bike with a front lamp visible from 300 feet and a rear reflector that is visible from a distance of 200 feet. Wear a bike helmet. The law requires all riders under 16 to wear a helmet. Bicycling on Interstate or fully controlled limited access highways, such as beltlines, is prohibited by policy, unless otherwise specified by action of the Board of Transportation. Other than the possibility of local ordinances, there is no requirement for bicyclists to ride single file, nor is there a law that gives cyclists the right to ride two or more abreast. Not only is obeying the laws of the road and bicycles important for your safety, if you do not obey those laws, and you do get in an accident, you may be barred from recovery even if the other person was at fault. Disobeying traffic laws that have been enacted for public safety is negligence per se, or negligence as a matter of law. North Carolina has the rule of contributory negligence. This means that if you as a bicyclist disobey one of the rules of the road, and it contributes, even in a small way, to your injuries, you won’t be able to recover any money for your damages, even if the other person was 99% at fault. --Bradley A. Coxe is a practicing attorney in Wilmington, NC with Hodges & Coxe PC who specializes in Personal Injury, Medical Malpractice, Homeowner's Associations, Contract and Real Estate disputes and all forms of Civil Litigation. Please contact him at (910) 772-1678. He rides his bike at lunch nearly every day. I had a meeting the other day with a client who was concerned about the status of his lawsuit. We represent him for the death of his father due to medical malpractice. Not surprisingly, he is constantly thinking about his father and his lawsuit, pouring over medical records, doing his own medical research and analyzing our expert’s reports and opinions. When a few weeks go by and he hasn’t heard from our office, he gets anxious and wants to know that we are doing all we can. When we had our meeting, I did a better job of explaining how the lawsuit works and the procedure that has to be followed. I explained that over the life of a lawsuit, there will be bursts of activity followed by weeks and even months of little or no action. The first burst of activity happens when the client first comes in. We get medical records, interview the client and any important witnesses, and get preliminary opinions. After that, there will be down time as we wait for all the medical providers to copy and provide records. Seldom do I get all the medical records on the first request, so there will be additional downtime. Once those records are received, they go to an expert for his review. In a medical malpractice action in North Carolina, medical experts are required to file a complaint and those experts have to be actively treating patients. As a result, there will be more downtime before the doctor can get to a review of the records. Once all the information is together and the opinions are finalized, there will be another burst of activity as the complaint is drafted, reviewed by the client and the experts and then filed. The ball is then in the defendant’s court. After they are served by mail or sheriff they have 60 days to respond with their answer. (Technically it is 30 days with a perfunctory extension of time for another 30 days). A month or two after that there will be another burst of activity around the written discovery, particularly as the client has to help provide all the answers. Depositions of experts and defendants will then take place and it often takes some time to get a date that is convenient for all the attorneys and experts. After all the discovery is completed, the lawyers and parties get their calendars out again to find a date to conduct the court-ordered mediation. This will be the final burst before the actual trial. Your attorney should notify you about the progress of a trial, and if you have not heard from him in 30-60 days, you should not be hesitant about contacting him about a status update, but keep in mind there are large stretches of time where there is nothing that is being done because nothing can be done. Any time you hire an attorney, they should provide you with a fee agreement to sign. The fee agreement provides both you and the attorney with some certainty as to what the attorney has agreed to do for you and what you are supposed to provide the attorney for his services. It is both good practice and an ethical requirement for the attorney to get this in writing. Attached is a copy of the fee agreement I use in my office. Download Fee Contract (Hourly) Although it doesn’t fit for every client and situation, it generally has the same language and intent for business clients, personal injury clients, family law clients and others. The introductory paragraph makes it clear who the firm is and who the client is. While this may seem obvious, and frequently is, it is very important to establish just who the client is. A lawyer has different and stronger ethical obligations to a client than a non-client. Note that a client is not necessarily the one paying the attorney fees. If the client is a child, the guardian will sign for the client, but the duties still run to the child. Paragraph 1 of my fee agreement also makes it clear that if a corporation is the client, that the person signing is authorized to sign. Frequently with small companies, the individual signing, as well as his company, has issues. That person will need to sign twice, once for himself and once for the company for the attorney to represent both. (This is assuming there is no conflict of interest in representing both). Paragraph 2 makes it clear what the client is hiring me for. I don’t want to do work for a client for something they don’t want or need me to do, and neither do I want the client to think I am working on an issue when I am not. The latter is especially dangerous as a statute of limitations could expire and the client could find a valid claim prevented by the passage of time. Paragraph 3 sets forth the client’s duties. If I can’t reach a client with important decisions regarding their case, I’ll have to withdraw. If a client is not truthful with me, I can’t give good advice on their case, and if it causes an ethical conflict, I’ll have to withdraw. Paragraph 4 is the retainer for an hourly contract. Essentially this is a refundable retainer that is based on a minimum amount to make a good start on a civil lawsuit. I will then send out monthly bills as set forth in Paragraph 5 and show the money moving from the client’s trust account, to the firm’s operating account. When I am no longer representing the client, for any reason, any funds remaining in the trust account of the retainer are refunded. Paragraph 5 is the rates for an hourly contract for attorneys, associates, and staff. Usually in my firm, one attorney and one paralegal work on a case, but occasionally other attorneys and staff will contribute. One of the questions every client should ask a potential attorney is who will be working on the case. In some firms, while a partner may sign up the client, a junior associate will do all the work. The staff work that is billed is usually confined to paralegal work as opposed to general office work such as copying, cover letters, and filing. In some cases, I will agree to represent the client on a contingency fee basis. Rather than an hourly rate for the fees, I will charge a percentage of the total recovery. For some cases in our firm, usually in the family law realm where the legal service is very specific, for a small amount of time, and we have a very good idea regarding the amount of work that needs to be done, we can charge a flat fee. Paragraph 6 defines the costs. Note that costs are in addition to the hourly rate or the percentage amount obtained by contingency. They are simply pass-through charges that are specific to the file. The biggest cost is usually when expert witnesses are hired. Those large costs are discussed with the client before they are incurred. Paragraph 7 gives my firm the duty to provide written monthly statements in hourly cases, and provides for interest for past due amounts. Paragraph 8 is the discharge. Essentially the client can terminate the contract for any reason or no reason. My firm can only withdraw with good cause. Usually when I am forced to withdraw it is for a lack of cooperation or a lack of payment. Although I have to file a motion and have a hearing before a judge before being allowed to withdraw, this process is not billed to the client. After withdrawal, the former client would owe any past balances for any work my firm actually did on the case. Paragraph 9 makes it clear that I cannot guaranty any result. In fact, I am ethically prohibited from making any such guarantee. Paragraph 10 is for situations where some work has been done, usually where time is of the essence, before a contract has actually been signed. Paragraph 11 is basic contract language that preserves most of the contract even if for some reason a particular portion can’t be enforced. Paragraph 12 is what is known as a merger clause. It makes it clear that the fee agreement is what governs the arrangement, not any prior agreements, statements, promises etc. If you are expecting something different or additional than what is in the agreement, be sure it gets included. Finally, the attorney who will be in charge of your case signs and the clients sign. When there are multiple clients, the all need to sign. They are usually billed jointly, but each is responsible for the entire amount of the bill. Starting on August 1, 2013, the amount you can sue for in small claims court doubles from $5000 to $10,000. Other than that, the basic rules remain the same. In a world overrun with computer-animated geckos, Paleolithic cavemen, bubbly spokeswomen, and catchy tunes, we are bombarded constantly with the idea that choosing an auto insurance company is one of the most important decisions we face in life. Make no mistake, insuring your vehicle is vitally important, but more important than choosing an insurance company is choosing an insurance policy. A very basic primer on North Carolina auto insurance is helpful when evaluating your auto policy. In North Carolina, like in most states, you must insure your vehicle in order to use it. The minimum policy limits for auto insurance, pursuant to N.C.G.S. § 20-281, are as follows: (1) $30,000 of coverage for injuries or death involving one person in a single accident; (2) $60,000 of coverage for injuries or deaths involving two or more people in a single accident; and (3) $25,000 of property damage coverage. Chances are high that your policy carries at least these minimum policy limits. But better practice may be to carry insurance with higher policy limits. The reason is that if you are found to be the “at-fault” driver in a serious accident where damages exceed your policy limits, you may be personally responsible to pay the difference. So what is an at-fault driver? Imagine that at-fault driver, B, crashes into innocent driver, A, causing $50k of damages to A and/or her car. Ideally, B carries auto insurance with policy limits that exceed A’s total damages, and A attains compensation of the full $50k from B’s insurance company. But what if B has no auto insurance, or what if she does, but the policy limits are insufficient to cover A’s total damages? In such cases, A can recover if she has uninsured (“UM”)/underinsured (“UIM”) motorist coverage. UM/UIM coverage is required to be offered in North Carolina, but you can “opt out” or decline that coverage. UM/UIM insurance, while typically grouped together, covers two distinct situations. First, UM coverage provides compensation for accidents caused by at-fault drivers who have no auto insurance. For instance, adding to the above scenario, imagine that B was illegally uninsured, but that A’s policy provided $60k in UM/UIM coverage. Then even if B was legally at-fault, A’s own insurance would cover the $50k of damages. Second, UIM coverage provides compensation for accidents caused by at-fault drivers who are “under” insured. Under insured drivers have auto insurance, but their policy limits are insufficient to cover the total damages. For instance, imagine that B was insured with maximum policy limits of $30k. If A’s damages totaled $50k, A could only recover $30k from B. A would need to seek the additional $20k elsewhere. But if A’s policy provided UM/UIM coverage with a maximum of $60k, A could collect that additional $20k from her own insurance company. So, when making decisions about auto insurance on the battlefield of incessant propaganda, shield yourself from insurance company jingles, mottos, and characters, and wield knowledge about different coverage options for your auto insurance policy. For the relatively cheap cost of UM/UIM insurance, I recommend that you purchase this coverage from the company of your choice. --Robert C. Ennis is a second-year law student at the University of North Carolina School of Law and is a summer associate with Hodges & Coxe PC. Advance directives can grant solace to you and your loved ones. Medical technology has advanced such that doctors can keep the body functioning longer than the brain. But some of us may not want our bodies to be sustained longer than we are able to think consciously and communicate meaningfully with others. North Carolina, under N.C.G.S. § 90-320, recognizes a right to direct medical care at the end of one’s life. In case you are too sick to make these decisions on your own, North Carolina provides for advance directives to give you some control over end-of-life medical decisions (i.e., whether and when to withdraw or withhold life-prolonging treatment such as ventilators or artificial nutrition and hydration). There are three situations in which your doctors may conclude that you unable to make your own medical decisions regarding your end-of-life care: (1) your condition is incurable or irreversible and the expectation of death is imminent (typically within six to twelve months); (2) you become unconscious and to a high degree of medical certainty will not become conscious again; or (3) you suffer from advanced dementia or another condition that significantly impairs cognitive functioning, which is irreversible to a high degree of medical certainty. In these situations, decisions about your end-of-life care will be governed by advance directives, if you have them, or by the N.C. surrogacy laws, if you do not. Advance directives come in two flavors: the living will and the health care power of attorney. A living will, promulgated by N.C.G.S. § 90-321, allows you to document your wishes about your end-of-life care. A health care power of attorney (sample), on the other hand, grants another person of your choice the authority to make any and all medical decisions on your behalf. While there is some overlap, these two advance directives are meant to be used concurrently. In the absence of advance directives, N.C. surrogacy laws govern end-of-life. N.C.G.S. § 90-322 provides that the following people, in this respective order, are granted the authority to make these decisions: (1) a legally appointed guardian, (2) a health care agent, (3) an attorney in fact, (4) a spouse, (5) a majority of your reasonably available parents and adult children, (6) a majority of your reasonably available adult siblings, and finally, (7) an adult friend. If none are available, your doctor alone may make the decision. But remember that if you do not fall into one of the three categories of incompetence listed above, regardless of whether you have executed advance directives, you will make your own medical decisions. Advance directives give you some control in deciding the course of your end-of-life care, grant whomever you choose the authority to make medical decisions on your behalf, and alleviate stress on your loved ones by documenting your wishes about end-of-life care. Without advance directives, these tremendously difficult decisions will be made by your loved ones in the order delineated above—whether or not you’d prefer that order. If you have strong feelings about your end-of-life care, who you want to make medical decisions on your behalf, or if you want to relieve some burden on your loved ones, consider speaking with your doctor and an attorney about executing advance directives. In New Hanover County, local politics has taken an interesting turn since the election of Brian Berger to the New Hanover County Board of Commissioners in 2010. Since that time he had clashed with other members of the Board and been accused of harassing staff and odd behavior. After an incident where he attempted to hand a manifesto to the governor of North Carolina on a visit, some members of the Board decided that he should be removed from office. Since there is no statute that governs the removal of a county commissioner, the commissioners relied on an old practice known as amotion. This practice is uncommon, and the last recorded use against an elected official was at the dawn of the 20th century. Nevertheless, since the law has not been repealed either by statute or by subsequent decisions by the North Carolina Supreme Court, it is still a valid and legal procedure. The practice is intrinsic to all corporations, including incorporated governmental entities. The cases that discuss amotion frequently discuss the procedural aspects, making sure that the person being removed gets a fair hearing. The person should have adequate notice of the proceeding; and an opportunity to be heard regarding the charges against him and to be able to produce testimony and evidence in his behalf. He should be provided a full and fair hearing on the merits of the charges and have the hearing documented through recorded minutes. Finally, as the hearing is a quasi-judicial hearing, the person should have the opportunity to appeal the amotion hearing. This should be to the Superior Court division of North Carolina, as the division with the highest original jurisdiction. The Superior Court judge should also be limited to a determination regarding whether the findings made in the amotion hearing that supported the removal could reasonably been made. In the hearing, the hearing officials have to find that there was reasonable and just cause for removal concerning the official’s misconduct or lack of fitness. There is very little caselaw on what behavior would rise to the level of misconduct or lack of fitness. A different procedure exists called an action in quo warranto, that is available to challenge the issue of legal capacity or qualification to hold office. An example would be a residency, age or clean criminal record requirement. That type of challenge is fairly straightforward as it is codified under sections 1-515, 515, 516, 522, and 528 of the North Carolina General Statutes. The quo warranto action needs to be brought within 90 days of induction into the office, unlike the amotion procedure, which has no time limitation. In addition, an action for mandamus can be brought in the situation where the office is vacant and a defendant is preventing a plaintiff from taking his position. After a four hour hearing before the Board, where he was represented by an attorney, Mr. Berger was removed in a 3-2 vote. Not surprisingly, Mr. Berger was one of the “no” votes. As of this time, he has not yet filed for an appeal to the Superior Court. A frequent misunderstanding about civil lawsuits that I encounter is about the payment of attorneys fees and costs. A sizeable number of potential clients assume that they can ask for the other party to pay their attorneys fees. Their (logical) thinking is they wouldn’t have to pay for an attorney if the other side would have done the right thing. This type of system is usually called the “loser pays” system. However, most of the United States, including North Carolina, follows the “American Rule.” In our system, each side is responsible for their own attorneys fees. The theory behind the rule is that people would be more inclined to fight for their rights in the court system if they did not have to worry about paying the other guy if they lost. Critics of the rule point out that, particularly in modern America, individuals are far less able to prosecute a lawsuit against corporations, businesses, and governmental entities who can afford to drag out litigation. Even an individual defendant in a car wreck lawsuit is backed by an insurance company who is paying the defendant’s attorneys fees and costs. If not for the ability of plaintiff’s lawyers to pursue cases for their clients on a contingency fee basis (meaning they earn a percentage of what they recover) hardly anyone would be able to fund a modern lawsuit. In North Carolina, there are exceptions to the American Rule. The North Carolina legislature can write specific laws that provide for attorneys fees. Some laws currently on the books that include attorneys fees are unfair and deceptive trade practices, frivolous lawsuits, suits against a city or county, and suits to enforce a lien. In addition to statutory exceptions, if the claim involves a breach of contract, and the contract calls for attorneys fees, those can also be recovered. The fees in such a contract action can’t exceed 15% of the claim. Similarly, a homeowner's association can recover for attorneys fees for a violation of their declarations, including failure to pay assessments, if that power is given in the declarations. Your attorney should advise you on whether or not any exceptions apply, but be clear you understand the ability and the likelihood of recovering attorney's fees when you make decisions on proceeding or settling your case. Lately I have had a few calls about the wrongful cutting of timber, so I thought I would update on the state of the law in North Carolina when your timber is illegally harvested. Basically, as I have written before, if a person cuts the wood off your property, intentionally or not, they are liable for double the net value of the timber. If you can prove it was done intentionally, or can show that it is a practice of this person or company, you may be able to get treble the net value and attorney fees under the unfair and deceptive trade practices statute. For more detail you can read my original article here. The statute of limitations for the wrongful cutting of timber is three years from the date the trespass began. (Four years if you can proceed under unfair and deceptive trade practices). One unique problem of timber trespasses is that the cutting usually occurs on rural property, far from major roads or residences. I currently have a client who had a tract of timber in a swamp, with no access other than by small boat. In that case it could be years past the statute of limitations before the cutting is found out. Therefore, timber cutting cases frequently benefit from an extreme application of what is known as the “discovery rule.” For the statute of limitations on timber cutting and trespass, as well as most other types of lawsuits, the statute does not begin to toll until the plaintiff knew or should have known about the trespass. In other words, to determine your deadline to file a suit, you start counting from the date you found out that your timber had been cut, or when you should have found out. If the property is on a street that you drive by several times a year, or if you hear a rumor that your property has been cut, but you fail to investigate, a jury could find that you “should have known.” I’ve had timber cases that survived a statute of limitations defense where the property was so far back in the woods that the owner didn’t find out until almost 10 years later, and that only from a coincidental aerial photo. Some types of claims other than trespass, notably medical malpractice and construction, in addition to a statute of limitations, also have a longer statute of repose, which is a hard deadline, and will start the clock running whether the plaintiff could have known about what happened or not. A lot of times it is easier as an attorney to obtain a personal injury or medical malpractice settlement from a defendant or an insurance company that it is to actually give that money to a client. One of the most common hurdles that an attorney and his client has to jump over is the payment of any valid liens. Essentially a lien is a claim by another person or company for some or all of the money that an injured person recovers in settlement or judgment of a personal injury or medical malpractice laws. Common liens are ones by Medicare, Medicaid, Teachers’ and State Employees’ Health Plans, ERISA, and Worker’s Compensation. One of the oldest and most common of the liens that can attach are those for medical providers. N.C.G.S 44-49 and N.C.G.S. 44-50 allow any person or company who provides drugs, medical supplies, ambulance services, physician, dentist, nurse or hospital services to claim a lien. In order to have a valid lien (or “perfect” the lien), the medical provider must furnish medical records upon request without charge. A provider is allowed to charge for copies of medical records under N.C.G.S. 90-410 and N.C.G.S. 90-411, but if it does so, it cannot have a lien on its bills for services. The lien rights are waived even if the bill for the copies is never paid or if the medical provider takes back the copying charges before they are paid. In addition, the provider must provide copies of the medical bills without charge. Further, the provider must give written notice saying that they are claiming a lien. That notice must be sent to the attorney for the injured person. Finally, the lien can only be valid if the medical treatment claimed is related to injuries that is part of the settlement or judgment. If the medical charges are for a condition that has nothing to do with the conditions at issue in a lawsuit, the provider can’t get a lien on those funds. So when considering a settlement for a lawsuit, always determine what liens are outstanding and what you will be required to pay out of any settlement. Under the community documents (declarations/covenants, bylaws, rules and regulations) and under the planned community and condominium acts in North Carolina, an HOA has certain obligations, for example, maintaining or repairing the common elements of the association. Unless it specifically sets forth in the declarations how late the pool can stay open or how many times a year the crape myrtles are pruned, the board of directors makes those day to day management decisions. If homeowner has a problem with the management of the common areas or other obligations like those, does he have standing to file a legal complaint against the HOA and the board and force them to perform? Theoretically, they do, but the way the law is set up, the facts need to be so extreme, that it is extremely rare. Boards of an HOA have the advantage of the same business judgment rule that other corporations do. Homeowners don’t really consider that they are part of a corporation when they own a home in a planned community with a homeowners association, but they are. The corporate business judgment rule gives a legal presumption to a Board. In any legal action against a Board for failure to perform its duties, a court initially is required to presume, without any additional evidence, that the Board acted due care and on an informed basis for any decision they made. The court further presumes that the Board acted with good faith that the decision was the best for the association, even if later the Board is found to be wrong. The complaining homeowner is the one who must produce evidence showing this was not the case. All the Board has to show is that there was some rational business reason for the decision. The Board doesn’t have to have made the best decision, just have any rational reason for making that decision. Usually the best way to effect changes in the management of a Board is to run for the Board and elect directors with the change you want. This usually can be done at an annual meeting, or at a special meeting called to remove the present Board. Can A Spouse be Excluded From Your Will? What if a spouse would like to leave their property to a person other than their current spouse? A person may create a will that leaves none of their property to their spouse. However, the spouse, may dissent from or reject the provisions of the will and take a share of the property of the decedent’s estate that is authorized by statutes. This share is commonly referred to as a spouse’s elective share. Pursuant to NCGS §30-3.1, only a surviving spouse may file a claim for an elective share. Additionally, the elective share petition must be filed in the spouse’s lifetime (and within six months of when letters of testamentary or letters of administration are issued by the Clerk of Court), by the spouse, or by the spouse’s attorney-in-fact. Pursuant to §30-3.1(3f), the following are a few examples of the type of assets that will be included in the elective share formula: property held in a revocable trust, joint bank and brokerage accounts, one-half of tenancy by the entirety property, life insurance on the life of the decedent, retirement accounts, property transferred within one year of death, and annuities. This is not a complete list of the potential property that will be included, but rather examples of property that may be included in the calculation. To determine the amount of the elective share, there will be a hearing conducted by the Clerk of Court. Additionally, mediation can be ordered by the Clerk of Court pursuant to NCGS §30-3.4(d1). The process of assigning a value to the assets of the estate as well as determine how much of each asset should be included can be a complex process. In summary, a spouse may attempt to prohibit the surviving spouse from inheriting any assets of the estate, but the surviving spouse has certain rights as granted by the North Carolina General Statutes. As a result, a full disinheritance of a spouse is not possible if the spouse uses the elective share statutes. --Guest post by Joshua G. Howell. Mr. Howell currently practices estate planning law with the King law offices. Bradley A. Coxe is a practicing attorney in Wilmington, NC who specializes in Personal Injury, Medical Malpractice, Contract and Real Estate disputes and all forms of Civil Litigation. On Who controls the roads?